Have you ever had to go through a “reinvention” of yourself? …when you first got married? Trying to figure out who you were as a wife, with a new last name on top of it! …when you had your first child? The constant reinvention as a mother is no joke! …when you started college? or took on a new career? …when you became a grandmother? or an aunt? or other special role? …when you quit a job, were let go, or retired? …when you had to become a caretaker of a parent or loved one? …when you or someone you love was diagnosed with a chronic illness or experienced an injury? …when you lost someone you love and had to redefine your life without them? …when you sent your last child off to college and were left with an empty nest? …when you realized you’re in the throws of menopause and all its glory? …when you went through a divorce or break-up? …when you realized your body couldn’t do what it used to do? …when you decided to take on a different lifestyle or change a way-of-thinking that has always ruled your life? …when you were hit with the realization that there was a disconnect in your life and something had to change? If you think about it, we’ve been reinventing ourselves well before our first training bra. I even see it in my 14-month old daughter, Lidia – she’s reinventing herself everyday as she discovers more about herself (and hopefully it’s a while before I have to deal with training bras!). We all go through reinventions. Usually many times over the course of life. Sometimes we reinvent ourselves because we choose to. > Sometimes we’re forced to. > Sometimes it’s scarier than hell. > Sometimes it feels like nothing in life has ever been harder. > Sometimes we resist it. Sometimes people will love you for it. > Sometimes people – even the ones you care about most – are not ready or willing to accept it. Or maybe they have their own idea of who you should be. But one thing is constant and true: reinvention is NECESSARY. Because if we’re not reinventing ourselves, we become complacent, uninspired, and even bored. We end up feeling like we’re not making progress, have no purpose, and we stop moving forward. The ultimate result? We feel like we’re trying to climb a slippery pole, we get frustrated, unmotivated, depressed, anxious, and our self-esteem and confidence plummets hard. As women we have to reinvent ourselves SO often in our lives, for so many reasons (just look at that list above), sometimes it’s just really hard to keep up. We don’t always have the time (correction: take the time) to (re)connect with our “reinvented” selves. Then 10, 20, 30 years of constant reinvention later, we don’t even recognize who we are anymore, like we’re stuck in a body and head space that isn’t ours. Some call it an identity crisis; some may even call it depression. In the last 11+ years I’ve had the privilege to train and coach hundreds of women of all ages and backgrounds through their own reinventions. Most women come to a point in their life where they want to reinvent themselves – whether it’s physically, mentally, spiritually, energetically…they just want to feel better, inside and out. Many of these women are frustrated because they’ve tried to reinvent themselves but feel like they’ve failed at it all – gyms, diets, self-help books, program after program…they’re sick of trying to figure it out on their own, don’t need the added stress in their life, and just need a simple solution. They want so badly to reinvent themselves, but they just don’t know what to do, so they give up and put themselves on the back burner (again) until the next time those feelings rear their ugly head (yet again). And the cycle repeats. They need a plan that works for them – for their own unique life – and it has to be simple to start, and more importantly, manageable in real life so they can stay on track without adding more stress to their already stressed life. Oh…and it needs to benefit their families too…happy and healthy mom/wife = happy and healthy family. They need accountability; because most of us just don’t have the energy to be super-self-motivated. They need support;without judgement, and alongside a community of like-minded women. They need education, a trusted resource that brings clarity to all the “noise” that we read, see and hear on a daily basis. Unfortunately, finding all this in one place is really hard to find. Our mission is to offer women programs, workshops, events, and individualized plans that provide accountability, support, and education in the realms of fitness and nutrition, habit and mindset change, and ultimately how to lead a life that is purposeful and meaningful. – Our Women’s Health Education & Motivation Series, “BP Answers“: These seminars and events are focused on answering questions on women’s health, stress management, fitness and nutrition, work-life balance and other topics to support a happier, healthier life. These seminars will be offered multiple times monthly, most often at our studio in Robbinsville and open to all women interested! – Our signature 8-Week Body Project complete lifestyle program (our spring session begins May 1st). – Commit2Fit, a 4-week program that is a perfect “first step” to get on track with fitness, nutrition and mindset. 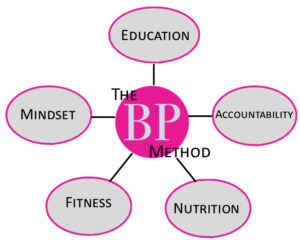 – Our new “MyBP” membership program that includes small group fitness training and tracking, coaching, and exclusive members-only seminars and events. Reinvention doesn’t mean that you have to compromise your values or change who you are at a core. I believe it means striving to become a slightly better version of ourselves each time. Focused on progress while fulfilling a purpose, but certainly not forgetting the past that makes our current version just that much more meaningful. I hope you’ll come experience the “reinvented” Body Project and let me and my awesome, caring team help you with a reinvention of yourself so you can achieve what you once thought was impossible.